January 1927 cover. 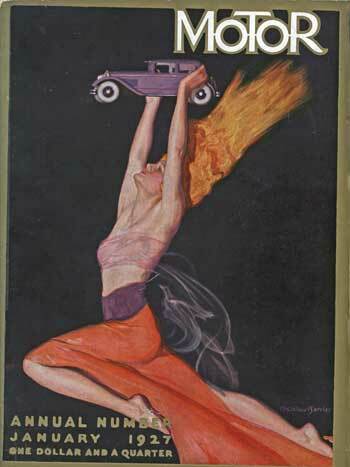 A woman, whose shock of flaming red hair trails her, wears a pink bandeau and long red skirt as she streaks through the night sky holding a car aloft. McClelland Barclay (May 9, 1891 — July 18, 1943), known especially for his pin-up art, was born in St. Louis to a surgeon father and a musically-inclined mother. He drew his first portrait at age 7, a recognizable sketch of Mark Twain. By age 14, he was drawing maritime scenes. He graduated from Central High School in St. Louis and studied at the St. Louis Museum of Fine Arts with its founder Halsey Cooley Ives. From there he studied at the Chicago Art Institute and the Corcoran School of Art in Washington, D.C. From 1912 to 1914, he learned figure drawing from George Brandt Bridgman and illustration from Thomas Fogarty at New York's Art Students League. By 1916, he was active in Chicago, becoming a life member of the Art Institute in October 1922. He was a man about town and, in February 1921, played a role in the Oriental drama "The Rose Garden". He was also elected the first President of the Chicago Guild of New York's Free Lance Artists. In 1923, as Secretary of the Association of Arts and Industries, he participated on a committee to launch an exhibit of commercial art works. During WWI he served in the Navy and won Navy and Marine Corps' recruiting poster contests. He also illustrated "The Human Cross" poster for the Red Cross. And he began work on camouflage design, which he would continue into WWII. His illustrations for products were far-ranging, including automotive advertisements for Peerless, Dodge, Mobilgas, Texaco, Cadillac Fleetwood, and Atlantic gasoline. His best-known automotive ads, however, were those drawn for a nine-year campaign for Fisher Body. Beginning in 1930, his "Fisher Body Girls" linked a shapely, stylishly dressed young woman (his 19-year old wife Helene Haskin was the model) to the newest automotive body styling. On an interesting side note, he patented a car design in 1932 for an open sports car with a shovel front grill (Packard's design came out that same year), curved bottom doors, and dual windshields for front and back seats. His other product designs included ones for Atwater Kent radios; Standard plumbing fixtures; Coca-Cola and Royal Crown Ginger Ale; Jantzen swimming suits; Ry-Krisp; Camel and Chesterfield cigarettes; Whitman's Chocolates; the 21 Club; Mum deodorant; Rogers Brothers silver; Eaton Paper Company; A&P grocery stores; Lever Brothers; and many more. By the 1910s, Barclay's work already graced magazine covers for publications such as The Saturday Evening Post, Ladies' Home Journal, and Cosmopolitan. In the twenties and thirties, he became even more prolific, illustrating covers for Collier's, Country Gentleman, Redbook, Pictorial Review, Coronet, Country Life, and a good many movie magazines. He used bold colors to paint square-jawed young men and strikingly beautiful women in fairly simple settings. During the thirties, he started to paint Hollywood movie poster art, even appearing on screen for Jack Benny's 1937 film "Artist and Models". He is also associated with poster work on 1939's "Elsa Maxwell's Hotel for Women"; 1940's "No, No, Nanette"; 1941's "I Wanted Wings"; and 1942's "Footlight Serenade" with Betty Grable. He was one of the first artists to depict Ms. Grable as the now-legendary pin-up girl. In fact, he was so well known as a man who appreciated female beauty that he was asked to judge at the Miss America Pageant in 1935. Although he said it never made him any money, in the late thirties he established a small company (McClelland Barclay Arts Products Corporation, with offices in New York, Boston, Chicago, Orlando, and Toronto ) to make artistic every-day products such as ashtrays, bookends, desk sets, bowls, boxes, trays, lamps, candle holders, and other similar items. The household articles were made of cast grey metal with a thick bronze plate finish and often featured animal figures. During this time, he also formed a working relationship with the Rice-Weiner Company to make costume jewelry from his art deco designs, known today as some of America's best costume jewelry. It was in September 1937 that he had his first fine arts exhibit — of seascapes, held in East Hampton. The following year he became a Lieutenant in the Naval Reserve where he continued his interest in camouflage. He went active duty on 19 October 1940, serving in the New York Recruiting Office where he was responsible for designing popular recruiting posters. After Pearl Harbor, Barclay volunteered to serve as a combat artist. While he did not move into the Combat Art Section, he did paint portraits of a number of senior War officials and photographed and sketched combat scenes. Appointed a Lieutenant Commander, he qualified as a diver and did short tours of duty in the Atlantic and the Pacific. He was aboard the LST-342, a tank landing ship, in July 1943 when she was torpedoed by a Japanese submarine in the Solomon Islands. Most crew members, including Barclay, died at sea. Barclay had been a dog lover, a member of the Masons, the Art Students League, the Chicago Art Club, the Society of Illustrators, the Association of Arts and Industries, and the Artists Guild. A year following his death he was given the Art Directors Club Medal, recognizing his illustrations and advertising art. The Society of Illustrators inducted him posthumously into its Hall of Fame.